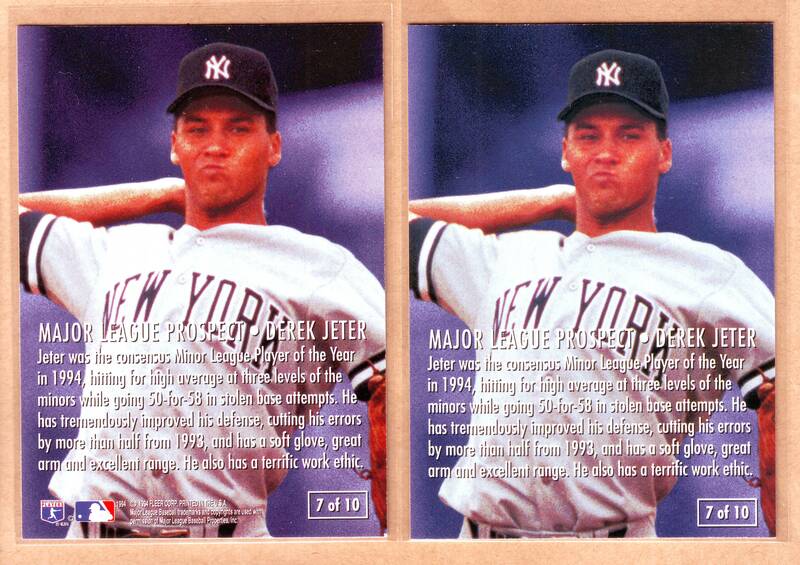 Quick Look: 1995 Fleer Derek Jeter ERROR. Great ‘Under the radar’ early card of the Yankee captain! I’m not quite sure when this variety was discovered but I do know that the majority of post 1991, non-Topps-issued variations are the middle children of the error card family. Doesn’t matter who they depict or how rare they are, they just don’t seem to warrant that “must have” feeling among variation collectors. My first in a short sub-series of posts focusing on mid-to-late 1990’s variations should challenge that idea as it goes to an early card of New York Yankees captain, Derek Jeter. Jeter’s 1995 Fleer Major League Prospects insert -his first fleer issue or ‘FFC’ for those that still care about that sort of thing- can be found with or without Fleer’s copyright info and MLB logos on back. Unfortunately, I don’t have a large enough sampling to gauge the scarcity of either type, though, I’ve only seen 2 copies of the missing info version to about a dozen or so of the corrected type.